Learners of Portuguese often ask what the best books to learn Portuguese are. There are several good books available. The best one for you will depend on your goals and learning style, and these may change along your language journey. Here are a few good books to consider. 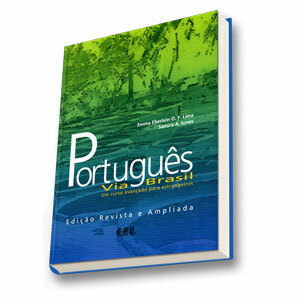 The new edition has access to their language lab, but only for college students enrolled in a Portuguese course that uses Ponto de Encontro as their textbook. This is a good book for exercises that use repetition. It does not give you grammatical explanations; it shows you how to do something and then it makes you practice with exercises. This is for Brazilian Portuguese. Each chapter starts with a dialogue or short text. The book has its accompanying set of CDs (sold separately) which contains all the dialogues and texts from the textbook (orange cover). This is a great book for students who want to do lots of straight-forward, repetitive exercises. In my opinion, repetitive in this case is a good thing and does not equate to boring. You need repetition to learn a language. The exercises will gradually build on vocabulary. For even more practice, there is the Caderno de Exercícios. 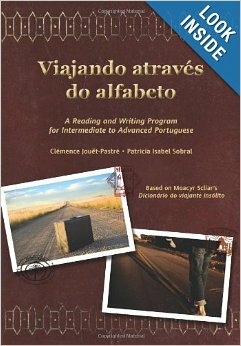 Below are great books to learn Portuguese if you are an intermediate or advanced learner. Especially if you enjoy a good read, it is worth using these books. Via Brasil teaches both formal and colloquial Portuguese. The texts presented in the book range from formal to informal language accordingly. Several of the texts bring a cultural element to the learning process which certainly adds value to the book. Just keep in mind that you need to enjoy reading to like this book. The language in the texts is not exactly direct and objective. It is literature, not a magazine article. For an updated list of good materials including movies, music, and more, visit our Amazon Store. There’s only so much that software and books can do for you. 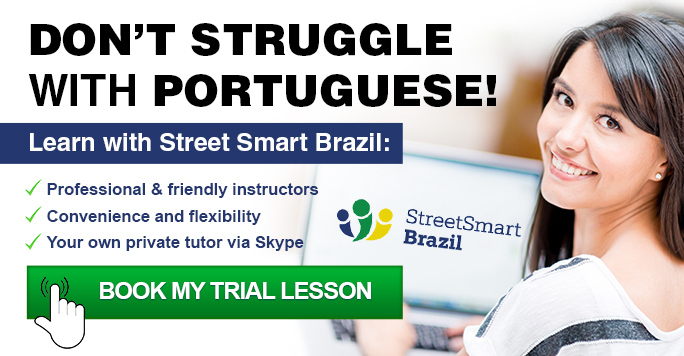 Take the next: Book a Trial Lesson with Street Smart Brazil to see the difference it makes to learn with trained and passionate professionals. 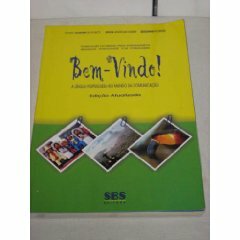 Gostaria de saber qual o melhor livro para seguir e dar aula para estrangeiros (total beginners to intermediates). Oi, Thiago. Isso depende do estilo de aprender de cada um. Os prós e contras dos livros que mencionei no artigo devem ajudar a tomar uma decisão. O ideal é conhecer vários livros e ver qual o que melhor serve para cada aluno. Hi, my neice is bilingual (English/Brazilian Portugese) and is learning to read (she’s 4). Can you recommend a good book or series of book (like the oxford reading tree “Biff & Chip”) that I could get her for a gift so she can learn both. thanks in advance. Oi, Kerry! That is so wonderful that your niece is growing up bilingual. Unfortunately I don’t have recommendations for kids books. I would try Amazon.com. Here are the results for a quick search I did there: https://amzn.to/2PsliZ3 I have not examined the results, however. 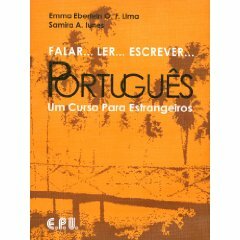 Hi, could u recommend Portuguese of Portugal text books for my 13 years old. She speaks, can write and read Portuguese as we were leaving in Mozambique.i need to prepare her for Portuguese gcse second language. Unfortunately I don’t have experience with Continental Portuguese books. Ponto de Encontro (https://amzn.to/2KF0R9G) is primarily a Brazilian Portuguese textbook, with some coaching and audio exercises that use Continental Portuguese. But it’s a very dense book and probably not appropriate for a 13-year-old. BOM DIA! Level 2. Bem-vindos ao Mundo Lusófono. and teach students about the Lusophone countries. Book 1 concentrates on Portugal, and Book 2 focuses upon the Azores and Madeira, Angola, Cabo Verde, Guinea-Bissau, Moçambique, São Tomé & Príncipe. The workbook accompanies Book 2.
order their Portuguese books from Wook.pt. Which one works on verb conjugation? What do you suggest to learn verbs in Portuguese? Falar Ler Escrever Português has lots of practice exercises. They are simple exercises with sentences that are not in context. It is good for those who want repetition. But you need to get the workbook in addition to the textbook to have enough exercises. Ponto de Encontro has lots os exercises if you get the workbook, but it is a dense, expensive book. I now own the new edition of FALAR, LER, ESCREVER. It is colorful, the design, layout and color photography are excellent; it abounds with color charts that highlight verb conjugations and other grammatical themes. There is a big grammar appendix at the back of the book, and plenty of exercises. 1. AQUARELA: Portuguese for Foreigners. 4th edition. The older editions of the book come with a CD; the fourth edition has internet audio files you can access from a website. AQUARELA has useful charts and complete answer keys in the back of the book. This book teaches the basics of Brazilian Portuguese and contains multiple exercises for each chapter. multiple Spanish-Portuguese lists for the learner and a huge Appendix with extensive grammar information and an index. POIS NÃO teaches the “tu” conjugation throughout the text. This book was developed specifically to teach Brazilian Portuguese to Spanish-speaking students at the University of Texas. 3. WORKING PORTUGUESE FOR BEGINNERS. Monica Rector; Regina Santos; Marcelo Amorim; M. Lynne Gerber. CD to accompany the book, and extensive practice dialogues. Is there any order in studying these books? In my opinion it is useful to use various sources of information, as they have different strengths and may offer complementary perspectives. I don’t really see an order in using these books. But notice, for example, that I mention that Bem-Vindo is all in Portuguese, does not offer grammar explanations, and progresses fast through grammar. So it might not be appropriate for everyone. You need to consider what book may be a better fit for you. Hi. Is there any order to study these books? Hi. Is there any order in studying these books? course, and have been assigned an ACCESS CODE by the professor! they have that precious ACCESS CODE given them by a professor. Lab for students not registered in a university course. The answer was NO. Charity, thank you for sharing this information here. I’m sorry you had this experience. FALAR, LER, ESCREVER. With CD’s. Emma Eberlein O.F. Lima; Samira Abirad Iunes. Date of publication: February 15, 2017. I would like to learn portuguese spoken in angola! Do you have any recommendation on books? Unfortunately, I don’t have it. Oi, Aline. Infelizmente eu não tenho experiência com ensino de crianças. Eu tenho uma professora que é muito boa com crianças, mas ela não usa um livro pronto. Ela prepara o material dela para as aulas. Sinto muito não poder ajudar. Hi Luciana! 🙂 Can I ask you which kind of book (not grammar.. a romance for example) I could start with to improve my knowledge of portuguese vocabulary? Thank you so much in advance and good luck with your amazing job! 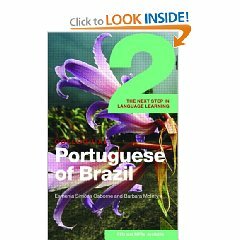 If you are a beginner or low intermediate, you might consider reading in Portuguese a book that you have read in English. Or a book that you have seen the movie. This will make it a bit easier. I have done three levels in portuguese but still I think I need to improve my grammatical part and need learn pronunciation and also vocabulary. could you please guide me which book and what way will be better to improve my portuguese. I strongly encourage your to choose a book that has accompanying audio files. It is important to do listening comprehension exercises. In my experience, books, audio, videos, and software can only do so much for you. To speak with ease and confidence, you need to speak with other people. Audio lessons or software cannot account for all the variations in speech that happen in a real-life, spontaneous conversation. Lessons with a trained instructor make all the difference because the teacher can give you timely feedback to improve your Portuguese. I cannot emphasize this enough: we only learn to speak a language by speaking it. We need lots of practice. That is the trick. Hi I’m interested in learning how to speak Portuguese,but I speak only English what book is best for be to start with?? Hello, I’m learning Portuguese at the moment. I was just curious which book should I start with if I’m a beginner? Oi! If you are a Spanish speaker, you can use Bem-Vindo. But keep in mind that it does not have any translations. The book is all in Portuguese. It also does not explain grammar. It just shows you how things are. 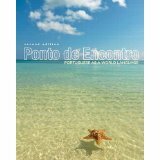 Ponto de Encontro is the only book that has explanations and they are in English up to about the middle of the book. It starts from the beginning. Good book for any level, but very dense. Oi, estou aprendendo ao falar portuguese brasileiro e eu gostaria ao encontrar um livro ao ajudar me, aguela tem um interessante mas facil estoria ao ler……eu encontrar os portuguese livros sobre verbs um pouco chato, desculpe! Oi, Jan, eu entendo. Os livros só sobre verbos são chatos, sim. Os livros que ensinam português para estrangeiros são esses que estão neste artigo. Obrigada por ler o blog e comentar! Oi! Muito obrigada for your comment. I really appreciate it. Your question is an important one. Bem-Vindo is a good book for Spanish speakers because it is fast-paced, but it is not targeted specifically for Spanish speakers. Com Licença, on the other hand, is meant of those who speak Spanish and want to learn Portuguese. It contrasts the two languages side by side. It is a good book, yes. There is another book by the same author for Spanish speakers: Pois Não. I like its dialogues. In my opinion, no book is perfect and the best learning happens when you learn from different sources. Since you have Ponto de Encontro, I would say that a book with lots of dialogues would be the best complement, as Ponto de Encontro does not have it. 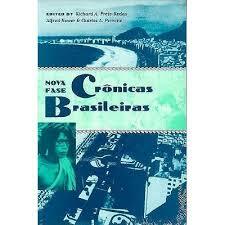 I actually have the Ponto de Encontro book, but haven’t put enough time into studying it. Just a question, I notice you reccomend the Bem-Vindo book for spanish speakers, but I was wondering if you have nay thoughts on the "Com Licenca" book, as it is actually geared toward spanish speakers. I don’t have it, but I was wondering if you can offer any comments on it. By the way, I love this blog and the website, thanks for making it accessable!